It looks like the week is getting off to a decent start. 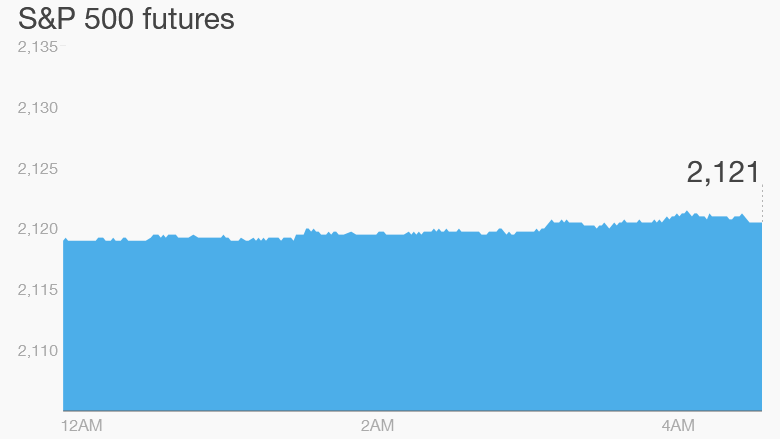 U.S. stock futures are edging up, all European markets are in positive territory and even Greek banks are reopening after a three-week closure. 1. Gentle markets: Global stock markets are looking stable at the start of a new week, though Asian markets ended with mixed results. Crude oil futures are flat, up 0.1% to trade around $51 per barrel. However, gold is on the skids, trading down about 1.6% to trade around $1,114 per ounce. The previous week was a strong one for stocks. The Dow Jones industrial average pushed up by nearly 2% over the five trading days. The S&P 500 did even better with a 2.4% gain, while the Nasdaq hit new record highs after surging by 4.3%. 2. Earnings: Earnings season continues with oilfield services company Halliburton (HAL) and Morgan Stanley (MS) reporting quarterly results before the market opens. Toymaker Hasbro (HAS) is also reporting earnings ahead of the open. The company has benefited recently from its ties to popular movie and TV franchises, including Transformers, Star Wars toys and Marvel. IBM (IBM) will report after the close. Related: Tech stocks are flying. Will Apple carry them even higher? 3. Greek banks reopen: Bank branches across Greece have reopened Monday after a three-week shutdown. Limits on withdrawals have been loosened a little, though daily and weekly caps remain in place. Other capital controls are also continuing and the stock exchange remains shut. The banks were shutdown and the stock market stopped trading at the end of June as the country teetered on the brink of bankruptcy, and people rushed to withdraw their savings. Now the situation is stabilizing as eurozone leaders have begun negotiating a new bailout for Greece worth as much as 86 billion euros ($93 billion). 4. Stock market movers -- Carmax, eBay: Shares in used car seller Carmax (KMX) saw a 2% boost in extended trading after the company posted strong quarterly earnings Friday. Shares in eBay (EBAY) are dipping by about 1.5% premarket, after surging by over 4% at the end of last week.